A few weeks ago, we asked you to get out and vote in what might be the most important election in a generation. We also asked you to vote in LAist's Ultimate Halloween Candy Ranker Quiz, which we divided into three categories: Chocolate, Fruity Rainbow and Old Timey. You delivered. 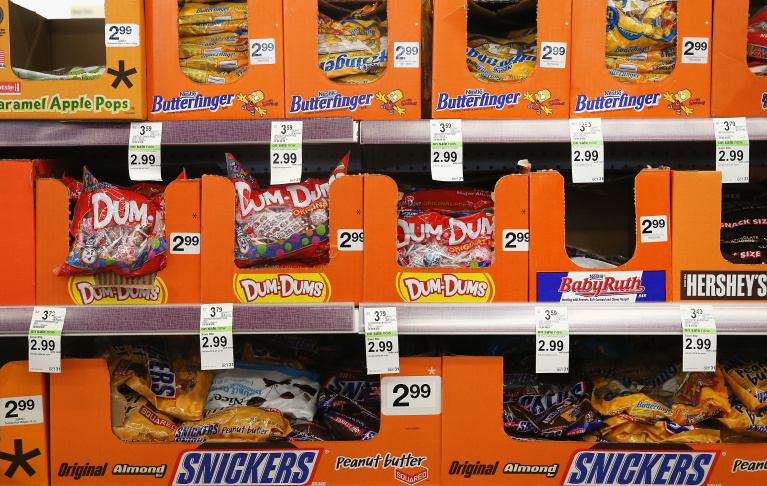 You told us in cold, hard numbers which candies you loved — and which ones you hated. You want the results? We got 'em. Now, get out there and vote on the issues that actually matter. UPDATE: Reese's set up a "candy converter" vending machine in New York City where people can dump their unwanted Halloween candy for peanut butter cups. We need this in L.A. stat! Chocolate is the supermodel of the candy world. As soon as she sashays into the room, heads turn and every other confection looks downright dowdy, especially if chocolate has caramel, nougat or peanut on her arm. Seriously, once you've tasted chocolate, it's hard for anything else to compete. No surprises in this category. Human beings who live in the United States under late capitalism have a strong genetic predisposition to love chocolate and the LAist Candy Ranker confirms that. This category had some legit contenders. Starburst, Haribo Gummy Bears and Jelly Belly jelly beans. They're bright and chewy and their intense flavoring agents have probably reshaped the way our palates perceive the flavors of actual fruit. Are they as good as chocolate? Of course not. But they stand on their own — and they get stuck in your teeth. Almost all of our survey's most hated items fell into this category. Why? Because most of these candies were invented in an era before humans knew how to make candy that tasted good. In fact, we have no idea why so many of these items are still being manufactured. (Something to investigate for next Halloween.) But there's somebody out there who loves the unloved Jujube, the benighted jawbreaker, the sad roll of half-crushed Sweet Tarts. Hats off to you! If you mine the dregs of other trick-or-treaters' candy hauls, you will always make out like a bandit. So Reese's Peanut Butter Cups won top honors, but the writer of this post, who also happens to be the Food Editor of LAist, thinks the #1 spot in the candy ranker should actually go to Snickers. Yes, that's right. In her heart, Snickers will always be #1. And there's nothing anyone can do about it. Welcome to America. All graphics for the 2018 LAist Halloween Candy Ranker were conceived and created by Dana Amihere.